Kendall Elise and her band return on November 30 with ‘The Clock Tower’ - the first single from her upcoming debut full-length album. 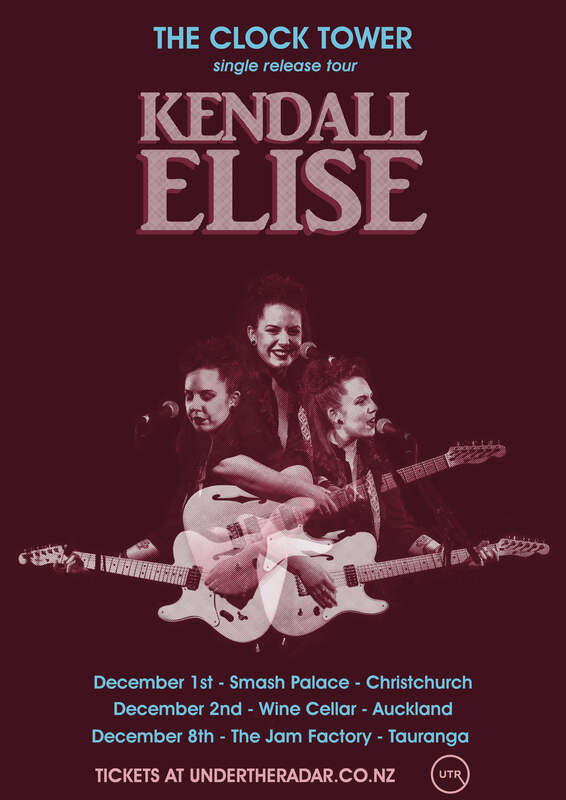 An intriguing storyteller blessed with an exquisite voice, ‘The Clock Tower’ was written and co-produced by Kendall herself, and recorded at the famed Auckland studio Roundhead, owned and operated by the legendary Neil Finn. ‘The Clock Tower’ is the first track from Kendall’s debut album, set for release in 2019. It paints a picture of what’s to come from this exciting Kiwi artist whose songs speak of dark humour and personal experiences; and whose sound takes inspiration from rhythm and blues, folk and country, and everything in between. She will be joined at the Christchurch show by local reverb scientists The Opawa 45s - "A schizophrenic electric guitar history band. Both kinds of music. Words are for losers". And in Auckland by Show Me Where It Hurts, playing big-hearted pop songs and heavy-hearted torch songs with a light-hearted reverie. Maximum R&B through the tight and focused bottleneck of a two-piece - gloried in the chaos when you tip the bottle over.